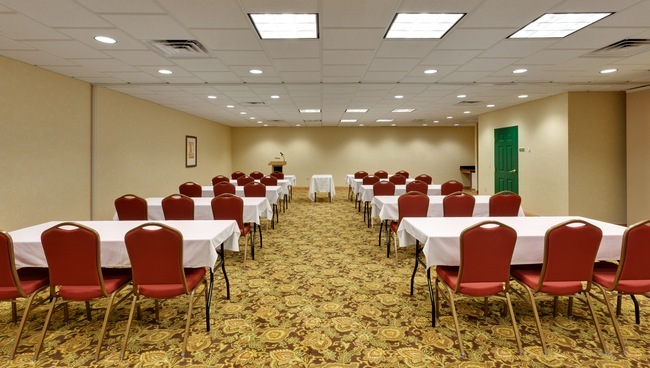 Whether you need space to host client interviews, employee training sessions or milestone celebrations, the Country Inn & Suites, Harrisburg, PA has the ideal meeting rooms for your event. Located at Union Deposit Road, our hotel offers a convenient gathering spot for up to 100 guests, with room dividers that allow you to break up your meeting into two 40-person events as needed. Use the free high-speed Internet access, a whiteboard and an easel with a flip chart to help you keep your audience engaged, or rent additional audiovisual equipment if necessary. Traveling with a sports team? The Country Inn & Suites, Harrisburg, PA is a Radisson Hotel Group Sports Approved hotel.